Binoculars are a great source of entertainment for anyone who likes to sightsee or bird watch. If you climb a mountain you can see further into the valley by looking through a good pair of binoculars. If you are bird watching, you will most likely need a pair to help you spot the bird that you hear. The Bushnell Legend Ultra HD M Series Binoculars are a great option for anyone who is looking for a full-feature observation experience. Let’s take a look at what makes it stand out from the rest. This pair of binoculars is lightweight, which makes is very convenient to carry around when you are trekking through the forest. In fact, it only weighs in at about 26.5 ounces. It is also a compact unit that is easy to pack in your backpack until you reach your destination, as it is only 6.5 inches in length. It is constructed with a magnesium alloy chassis that is designed to be resistant to rust and corrosion, which means that if you get caught in a rain storm, the binoculars will not be damaged. These binoculars feature an open bridge design that is perfect for storing your device in a compact manner. It also makes the unit easier to hold for extended periods of time. The exterior of the Legend M Series is also coated with a convenient non-slip coating to allow you to keep a firm grip on the device. If it does happen to make contact with the ground, the rubber exterior is designed to protect the device against impact damage. The RainGuard HD lenses are coated with a repellent that is designed to bead water and moisture that finds itself in your viewing area. That means that it will also repel oils from your skin in the event that you accidently touch a lens. In addition to being water resistant, each lens is filled with nitrogen to make it fog proof as well. No matter what adverse weather conditions you run into, the image through these binoculars will still be crystal clear. This pair of binoculars features 42 millimeter objective lenses that offer a ten times magnification level that will help you zoom in on your target. The BAK4 roof prism system utilizes a highly reflective coating that is designed to enhance the overall quality of the image by enhancing the contrast and brightness levels that are available to you. In addition, to help create the best resolution, the fluorite glass of the lenses is designed with extra low dispersion to create a clear image. The lens is also anti-reflective, so if you are looking into the morning sun to spot a bird, you will still be able to see clearly through the binoculars. It also helps to ensure that the color of the bird you see is the same through the lenses as it would be if it were spotted with the naked eye. The Bushnell Legend M Series features a wide field of view to help you see more at once. In fact, you can see a 340 foot range at a distance of 1,000 yards. That means that you will have a 65 degree angle of view that will help to give you a fully immersive observing experience, which is a pretty large viewing area, especially when compared to some similar binoculars that are sold in the same price range. Insofar as eye relief is concerned, this device has quite a long one; in fact, it is 22 millimeters long. That gives you more than enough room to comfortably wear glasses and still see clearly through the lens. In addition, the diameter of the exit pupil is 4.2 millimeters, which is a pretty decent size. That large exit pupil allows more light to enter the viewing area, which bathes the image in a beam of light that enhances the quality of what you are looking at. Not everyone has the same eye shape, so the eye cups can be adjusted to give you a comfortable fit. Simply twist them to the desired level and click them into place for comfortable viewing. In addition, the diopter is designed with an easy to use thumb adjustment tab so that you can make minor changes while you are viewing. Focusing quickly is imperative if you are going to catch a glimpse of the bird you just heard. To make this easier, a large focus wheel is located in the center of the device that is easy to maneuver with gloves on, and all of the focusing aspects of the Legend M Series can be locked in place to avoid accidental adjustments from occurring. There is a tripod adaptor available for this unit if you prefer. Lens covers, a neck strap, and a carrying case are all included with the packaging to help prevent damage as well as a microfiber cloth to keep the lenses clean from dust and debris. 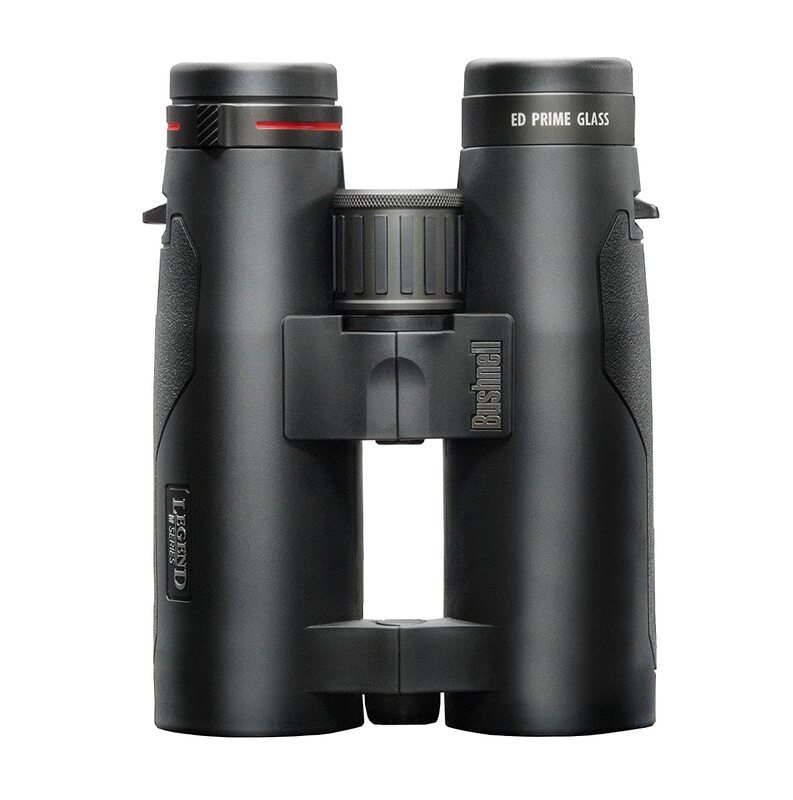 If you are looking for a great pair of binoculars that offer a great value to hunters and bird watchers alike, then the Bushnell Legend M Series may be a great option for you.